Read the textbook chapters 30, 31 and 32. Read the short account of the expulsion of the American citizen George Kennan from Russia. Check the remarks by Professor Blois and Professor Evans on Alexander III and Nicholas II. Read chapter 25 and chapter 26 from Mary Platt Parmele (1843-1911) A Short History of Russia (1907, 4th edition). These are short chapters, and this is optional reading. For 50 points maximum extra credit, take a look at the 1897 map of St. Petersburg. In a one-page paper, exlain what you can discover about St. Petersburg at the time from looking at and analyzing this old map. For 50 points maximum extra credit, read Edward Judge, Easter in Kishinev: Anatomy of a Pogrom (1992) and write a one-page paper, "What were the government's motives in instigating the pogroms?". 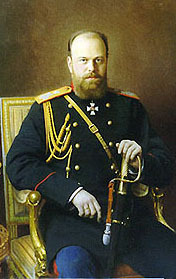 For 25 points maximum extra credit, read the Letter of the Revolutionary Committee to Alexander III, written after the assassination of Alexander II, and write a long paragraph that answers the question, Do you think that this was a wise move, sending this letter, on the part of the Russian revolutionaries? (Check the tsar's Manifesto of April 29, 1881, a *.pdf file). For 25 points maximum extra credit, read some excerpts from Konstantin Pobedonostsev, Reflections of a Russian Statesman (*.pdf), and write a long paragraph that answers the question, What were some of the main tenets of Pobedonostsev's political philosophy?